A collaboration of the Frye Art Museum and the University of Washington is forging a relationship between art, medicine, and dementia-friendly community programs in Seattle. “I can’t quite figure out the expression on his face,” says a man named Jim, as he and a group of ten people seated on foldout chairs gaze at Henry Raschen’s 1916 portrait of Chief Seattle, one of hundreds of landscapes and figure studies that cover the gallery walls of Seattle’s Frye Art Museum in ornate golden frames. This is here: now, an arts engagement program for persons living with dementia and their care partners. 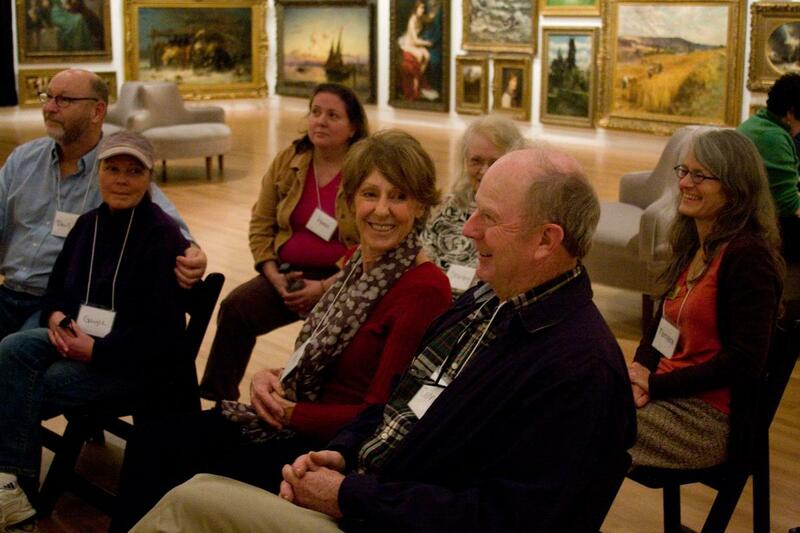 Launched in 2010, in partnership with the Alzheimer’s Association and Elderwise, this art museum gathering invites people to leave behind talk about decline and celebrate personal strengths, creativity, and social time. This free program offers regular gallery tours, on which small groups visit four art works connected loosely by a theme, such as waterscapes or, like today’s focus, portraits. An art educator leads a conversation that focuses less on memory recall and more on the thoughts and feelings brought up by the artwork in the moment. Peggy Vanbianchi, a local artist and art teacher, leads today’s tour, on which a few of us in the UW Memory and Brain Wellness Center are tagging along. Her open-ended questions and affirming responses lead to a collaborative, lively conversation that keeps the group gathered around one painting for over twenty minutes. “Ah, so you are noticing that Chief Seattle’s facial expression is hard to read,” Vanbianchi responds. “Yes,” says Jim. “Somewhere in there.” His wife Carol, seated beside him, nods in agreement. Now in its fifth year, here: now has its own momentum, so Knecht has turned her attention to reaching people with more progressed dementia who can no longer access the museum experience. She recently piloted Bridges, a program featuring one-on-one art making sessions with trained volunteers and teaching artist Carmen Ficarra, both at Seattle-area adult care centers and private homes. When Dr. Lee Burnside, a geriatrician at the University of Washington, learned about here: now, he was instantly excited by its potential for patients. He remembers how his own father’s afternoon painting sessions with an art instructor helped to maintain his sense of identity as an artist while enduring Parkinson disease with dementia. “In expressing yourself in an artistic process, you’re able to take those limitations and put them aside for a bit,” he said. 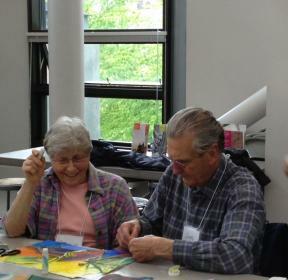 “I think art is a way to sidestep the cognitive impairment so we can be closer and share things,” says Burnside. Anecdotes aside, a number of observational studies from around the world suggest that art engagement can improve a person’s mood and wellbeing in the face of as yet incurable cognitive decline. The hope, shared by both Burnside and the Frye’s Mary Jane Knecht, is that arts engagement programs become widely accepted as a treatment—that doctors will refer people developing a form of dementia to these programs as a standard component of care. Making headway on this front, Burnside partnered up with Knecht and UW clinical psychologist Rebecca Logsdon to perform a study of the effectiveness of the here: now program in enhancing the wellbeing of its participants, with a special focus on the relationship dynamics between the people with dementia and their care partners or companions. For the study, now published in the journal Dementia, the team interviewed attendees of here: now tours and the studio art classes two weeks after their last participation. They surveyed both the caregivers and the people with dementia who could still communicate, asking detailed questions about their experiences at the Frye and their life outside the museum. From the hours and hours of feedback, they plucked out the common themes contained in the participants’ words. The research found that, by far, the here: now participants most highly value the shared experience of mindfulness, or the act of paying attention to the present, purposefully and non-judgmentally. “Being in the moment” together, in turn, often gave a person with dementia and their care partner some respite from daily norms and a chance to interact with each other, and the whole group, in a new way. It’s also the little things that count in a program that caters to people dealing with sometimes stressful and exhausting daily routines. “Being free is huge. Easy parking is huge. Time of day is huge,” says Burnside. Here: now’s accessibility is made possible by philanthropic support of the Frye Art Museum since 2010, and grants from the US National Institute of Libraries and Museums and the Richard M. and Maude M. Ferry Charitable Foundation, among others. 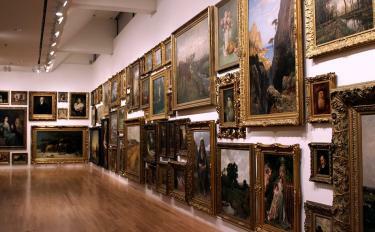 As the research collaboration between the Frye Art Museum and the University of Washington found, here: now brings improvements in quality of life that transcend the individual and touch on the social processes at the heart of being human, such as accepting a changing relationship and recognizing personhood and the intrinsic value of being present with loved ones. Here: now offers more than the sum of its parts, suggesting that the real benefits of art engagement programs for those dealing with dementia are, in a way, immeasurable. We try to create a positive and safe environment where people are able to participate in a way that perhaps out in the world they’re feeling less comfortable with. Art, Dementia, and Creativity: A panel discussion about the arts, creativity and dementia featuring our friends, colleagues…and us!